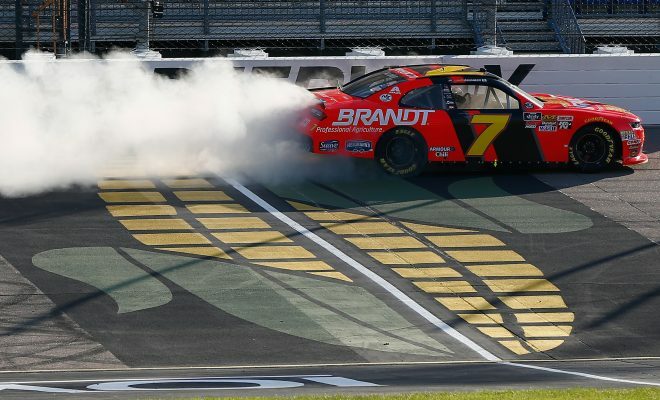 (via NASCAR Wire Service) Justin Allgaier dominated Sunday’s Iowa 250 presented by Enogen but had to hold off a hard-charging Christopher Bell for the victory at Iowa Speedway. Allgaier swept all three stages on the day for the race win and his second NASCAR Xfinity Series victory in 2018. “Incredible. We’re in the middle of corn fields — how could you not enjoy this? … Doing it on Father’s Day, it was really cool having my daughter here,” Allgaier said after getting a hug from his 4-year-old daughter Harper Grace. Allgaier faced a variety of challengers throughout the day. The driver of the No. 7 JR Motorsports Chevrolet chased down polesitter Austin Cindric in the closing laps of Stage 1 for the lead and the stage victory. He then did battle with Daniel Hemric for the bulk of Stage 2 before pulling away late in the 60-lap stage. In the final stage, Allgaier had repeated battles with Bell for the lead position but was able to keep the Joe Gibbs Racing driver at bay for most of the final run. The win is the seventh of Allgaier’s career in the Xfinity Series, and the seven playoff points on the day give him eight on the season now. Penalties took away the playoff benefits from his Dover win last month. The 182 laps out front were the most ever for Allgaier in the Xfinity Series. Bell made an impressive drive up from a 39th-place starting spot after the No. 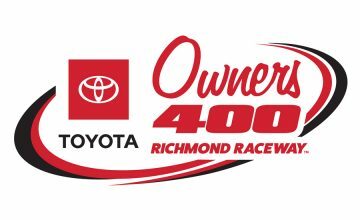 20 JGR Toyota did not make it through qualifying inspection earlier in the day. By Lap 28, he was in the top 10, and he was Allgaier’s main challenger for the bulk of the final stage. “Man, I just needed to be in front of him,” Bell said. “Our (car) was really good. … I just didn’t have enough to clear him. He could just kind of ride ride that outside there, outside my door, just keep me pinned down. But we had a really good Rheem Camry, just unfortunately not good enough to get by him. Hemric finished third, while Cole Custer came home fourth — his fourth straight top-five finish in the series. Both drivers also closed the gap on points leader Elliott Sadler through their own good runs and some misfortune for the JR Motorsports veteran. Sadler made contact with the wall towards the end of Stage 1, which that forced him down pit road under green and left him several laps down and out of contention en route to a 28th-place finish. He came in with a 41-point lead in the standings and left with a four-point lead over Custer and a seven-point lead over Hemric. Brandon Jones completed the top five. Riley Herbst, piloting the No. 18 JGR Toyota, finished sixth in his first NASCAR national series start. Ty Majeski scored a career-best seventh-place finish in just his eighth start in the series. Tyler Reddick, Matt Tifft and Kaz Grala rounded out the top 10. Cindric, driving the No. 22 Team Penske Ford, earned his first pole in the series and led the first 58 laps of the race but finished 11th on the day. Justin Haley scored a 12th-place finish in his series debut in the No. 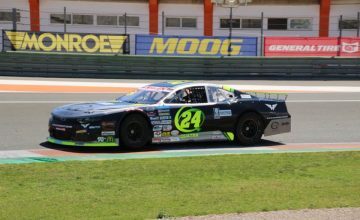 23 GMS Racing Chevrolet. The Xfinity Series is off next weekend but will be back in action at Chicagoland Speedway on June 30 with the Overton’s 300 (NBCSN, MRN, SiriusXM NASCAR Radio).